When you mean business, it can only mean one thing – you mean Antler. Combining strength, style and security, the Business 100 collection proved to be a real hit with true professionals, as did the Business 200 range. Finally, Antler have released their best luggage collection yet – the Business 300 collection. Business 300 luggage is designed for the modern business person, who likes to travel with distinct sense of prestige. This range of luggage has a smart contemporary design and offers storage solutions for all kinds of business travel, as is evident with the Business 300 Document Bag. Crafted from hard-wearing polyester, this document bag is perfect for those always on the go. Featuring a classic professional business styling, this bag comes with padded pockets for your laptop and tablet and an RFID pocket to block thieves from accessing sensitive information on your credit cards and passports. Carry your essentials in style – professional style – with a little help from Antler. 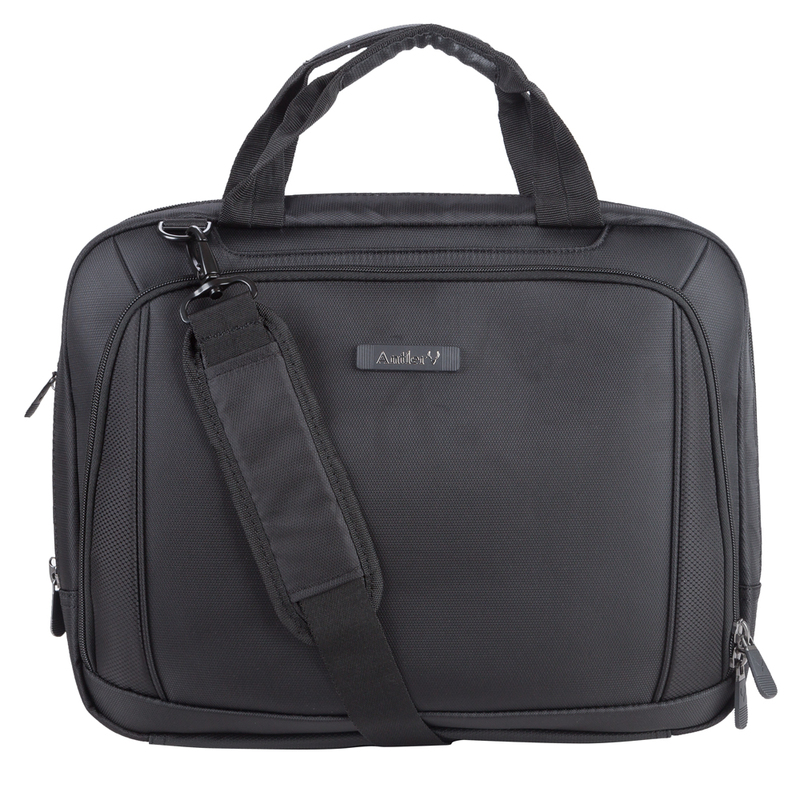 Main compartment includes two padded pockets- one for a laptop and the other for tablets. Zippered pocket on the back of the bag. Back of the bag features an open flap, allowing you to thread the bag through trolley handles. Front compartment includes two large pouches, two small phone pouches and two pen loops. Front compartment also includes a zippered RFID pocket, blocking sensitive information on your credit cards and passports from digital thieves. Discreet pouch at the top of the bag includes three card slots. Dimensions: 42cm (l) x 33cm (h) x 13cm (w).